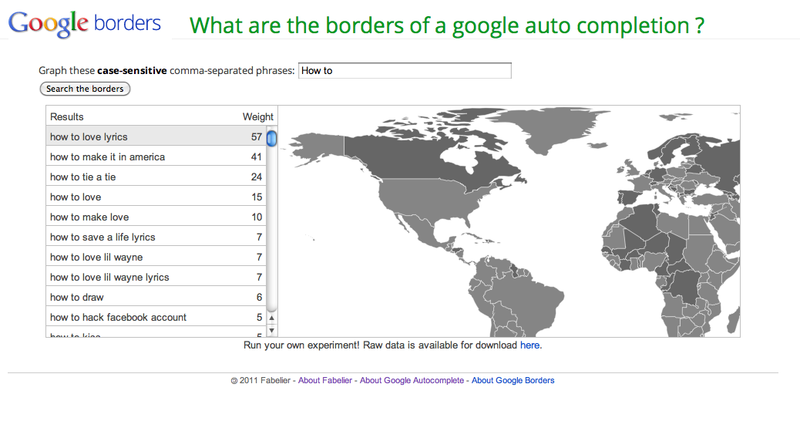 Google borders is a tool to map the google autocompletion over the world. Zeitgeist (from german, spirit of the time) Google Borders was inspired by an article in Le Monde highlighting the fact that, based on google recommendations, french request on the web are specifically questioning wether famous people are jewish or not. Beyond this polemic fact, the article showed that google recommendation system and the informations it provides on popular search queries, could allow any user to analyze worldwide county-based specific cultural specificities. This project aims at allowing users to compare the recommendations they get in their country with others and question and visualize by themselves some cultural traits.